I keep a folder with all the craft projects I'd like to try (it is an extremely large file). This one has been in the folder for quite awhile, which is a bit of a surprise to me because I have been making my own laundry soap for years. 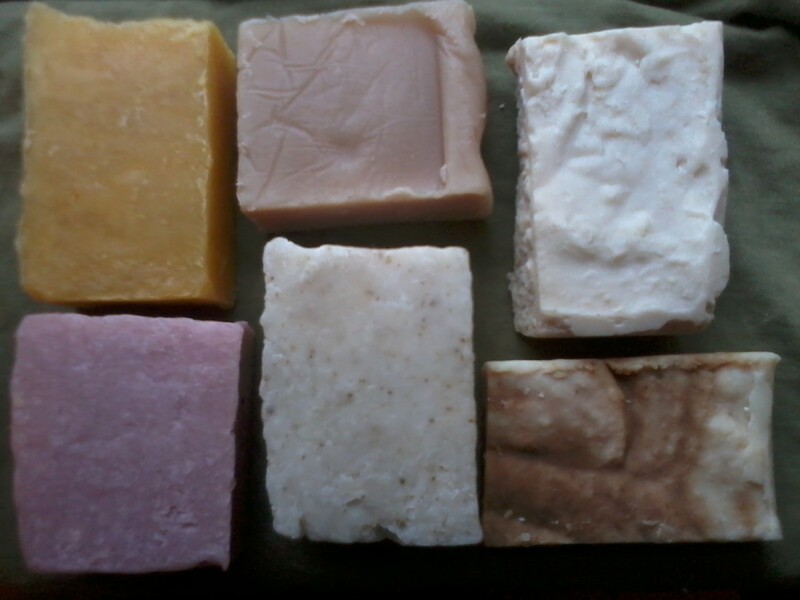 I was originally inspired to make my own soap to eliminate so many of the chemicals in the products my family was using. 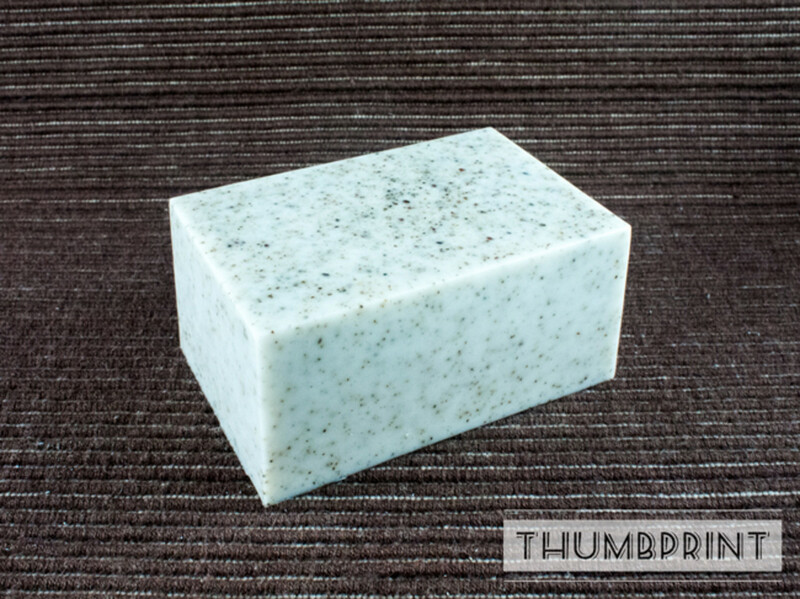 I was quickly turned a believer when I discovered how well my soap worked and how inexpensive it was. 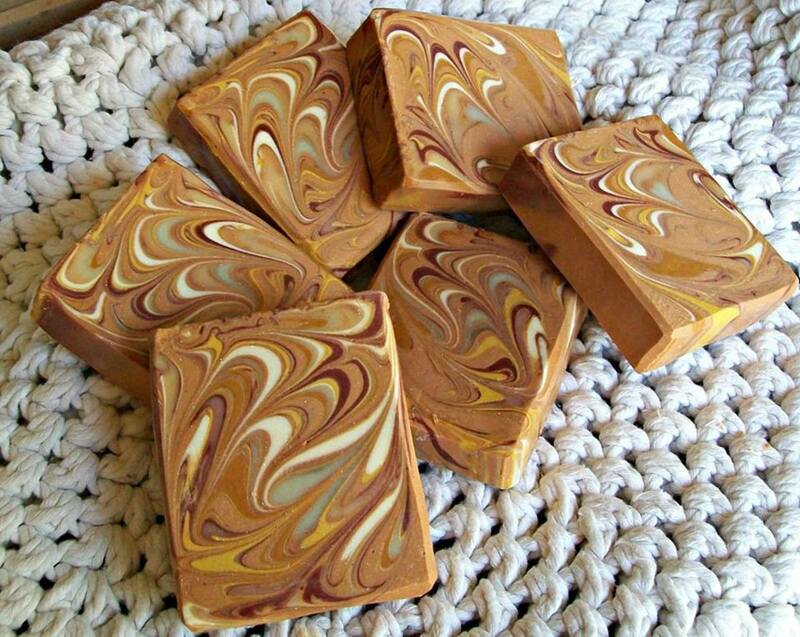 After so many years of concocting batches of my soap, my husband encouraged me to sell it. So I do. I obviously needed to come up with a product name and what came instantly to mind was Basic:Clean, 'cause that is exactly what it is and what it does - just like this hand soap. I was nearly down to my last drop of hand soap in both of my bathrooms. Two brands, by the way, that I really love, but both cost a pretty penny from this wonderful boutique down the road and I don't really know what is in them. 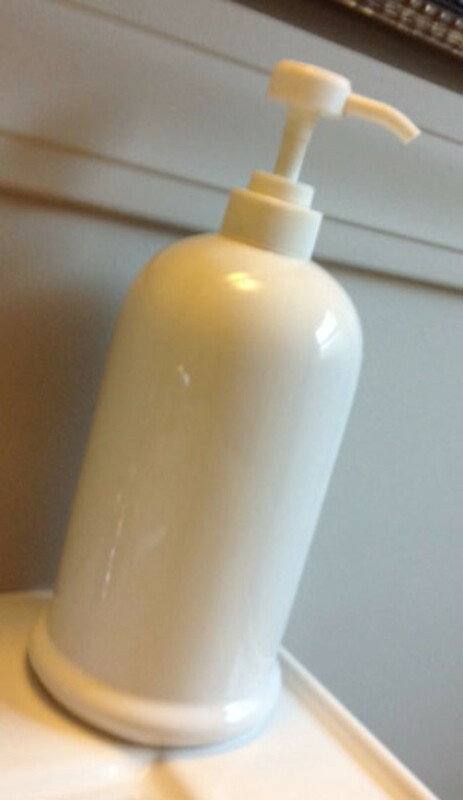 So there was no time like the present to try making my own hand soap. The ingredient list couldn't be simpler. One stop at your local pharmacy or coop and you should be set. 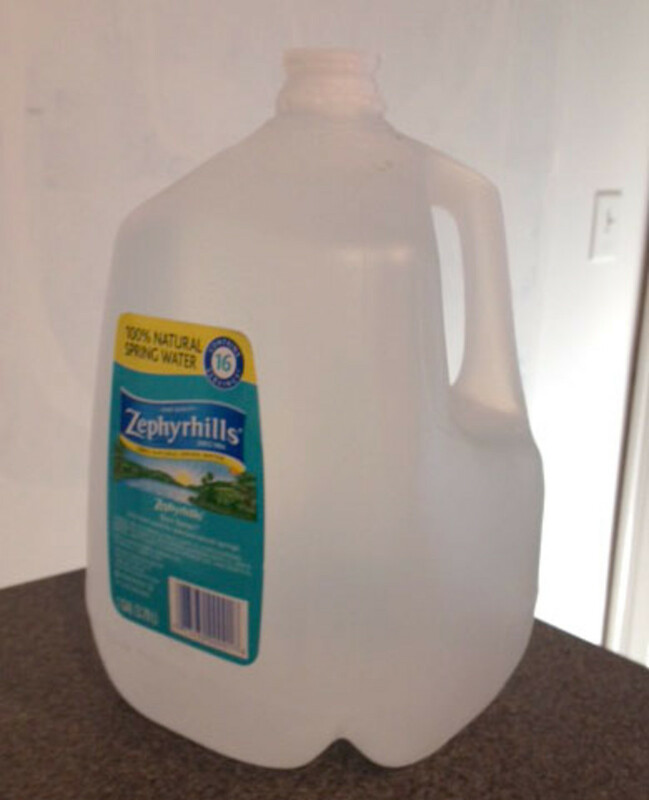 From all the recipes that I have read, it is not necessary to use distilled water. 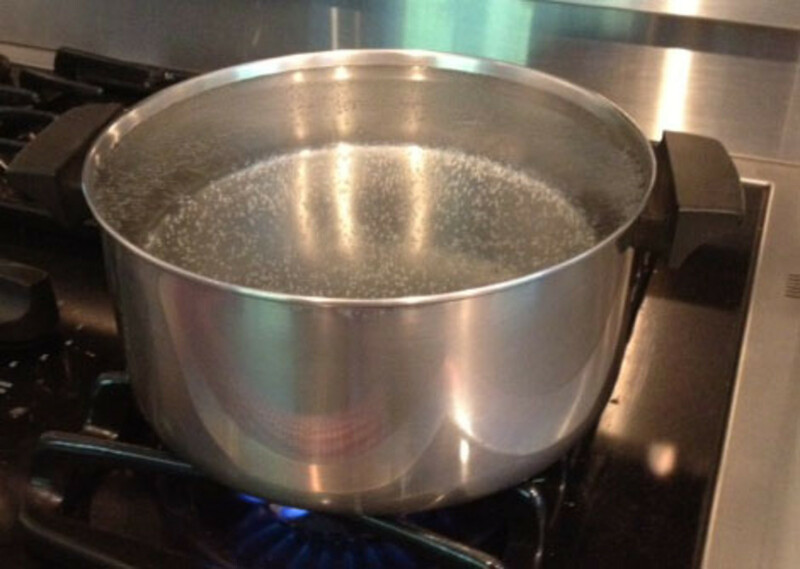 Of course, you could use tap water and boil it, certainly. 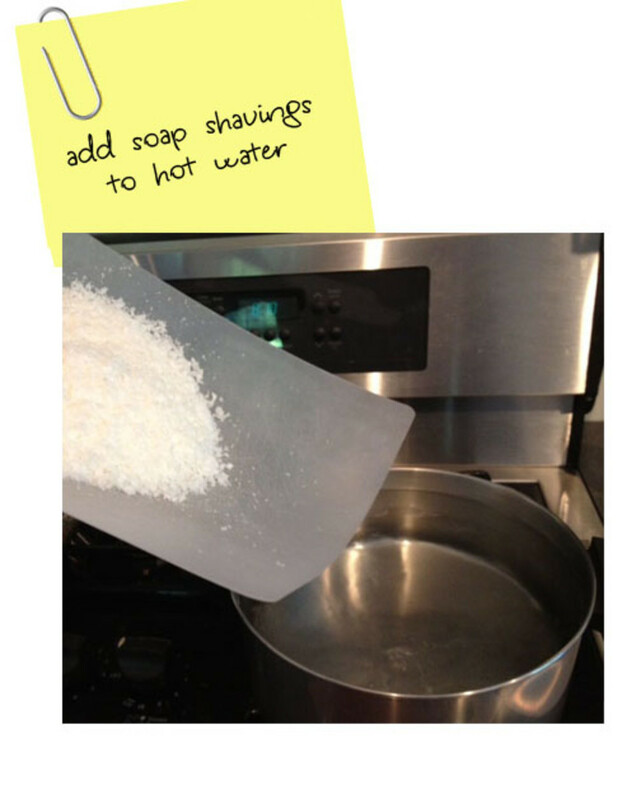 You could make a small batch of hand soap and use water from the tap and see how it works for you. We have well water. Next time, I'm going to give that a try. I wanted an unscented soap. I also wanted to try goat's milk. 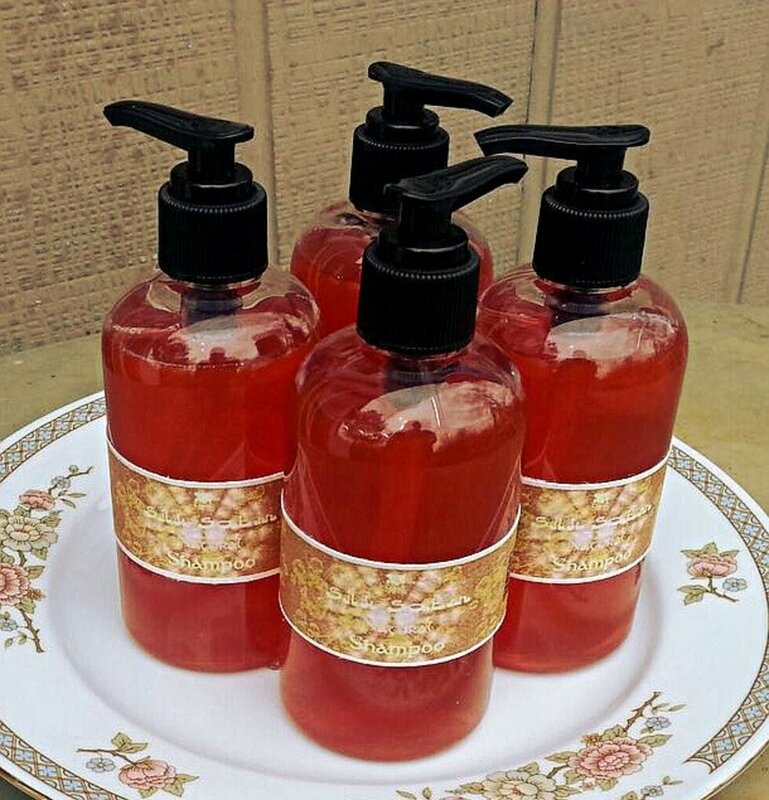 You could use a variety of different brands to make you hand soap. If you are not overly concerned with the ingredients in commercial soaps, you could use a market brand for around a dollar. Imaging the cost savings then. 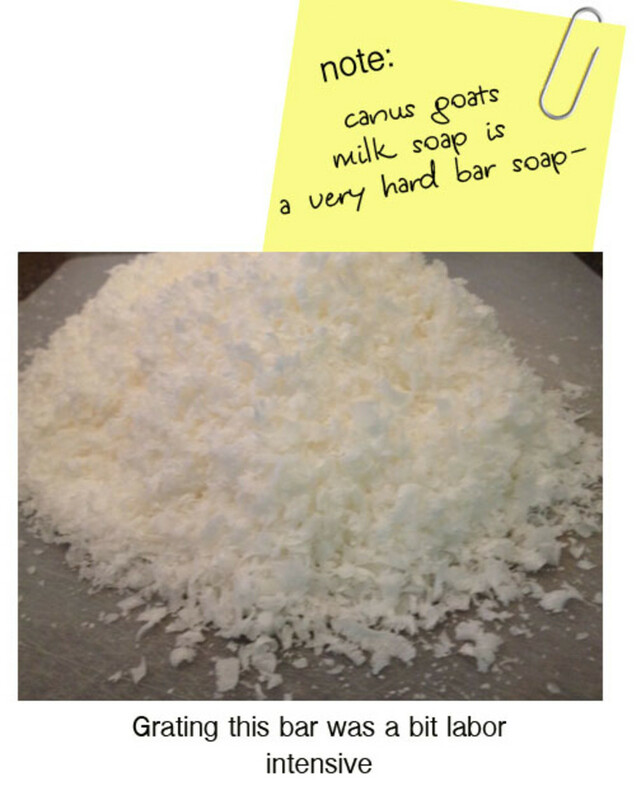 The recipe that I followed suggested I use an 8oz bar of soap. Clearly, I was to be using 2 oz more than recommended. I'm a rebel. When all was said and done, I don't think it mattered much. I merely needed to add a bit more water to my soap until it was a smooth consistency. I'm not sure what else I will use the liquid glycerin for, but I have plenty left over. 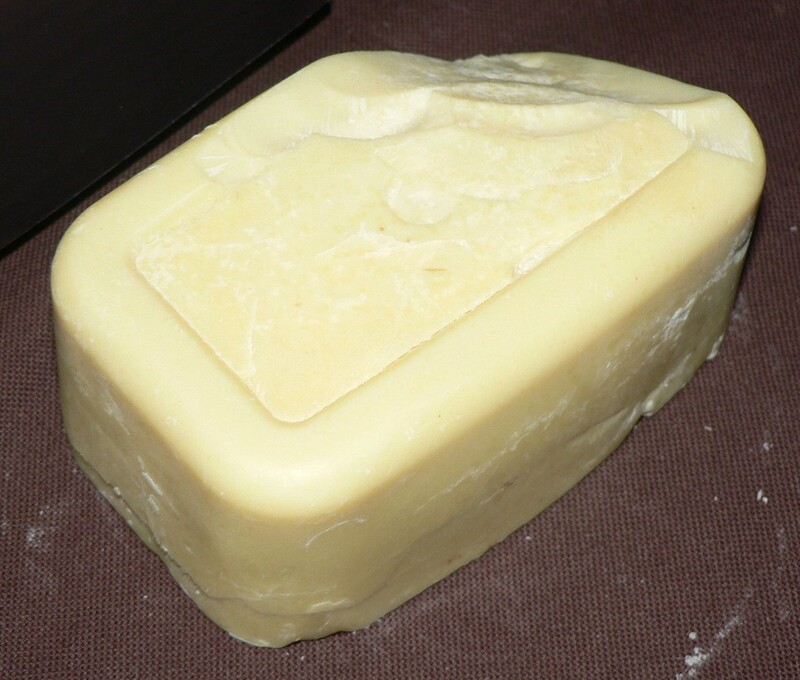 I've never added glycerin to my bar soap that I make. I should consider that. In the mean time, I recommend that if you have friends who enjoying this sort of project, gather them together and make an afternoon of it. More often than not, it is the cost savings that get folks to try projects like this. So I thought that I would offer up a little bit of encouragement. From my store receipt above, you can see that I spent $18.91 (okay, so a rounded down). 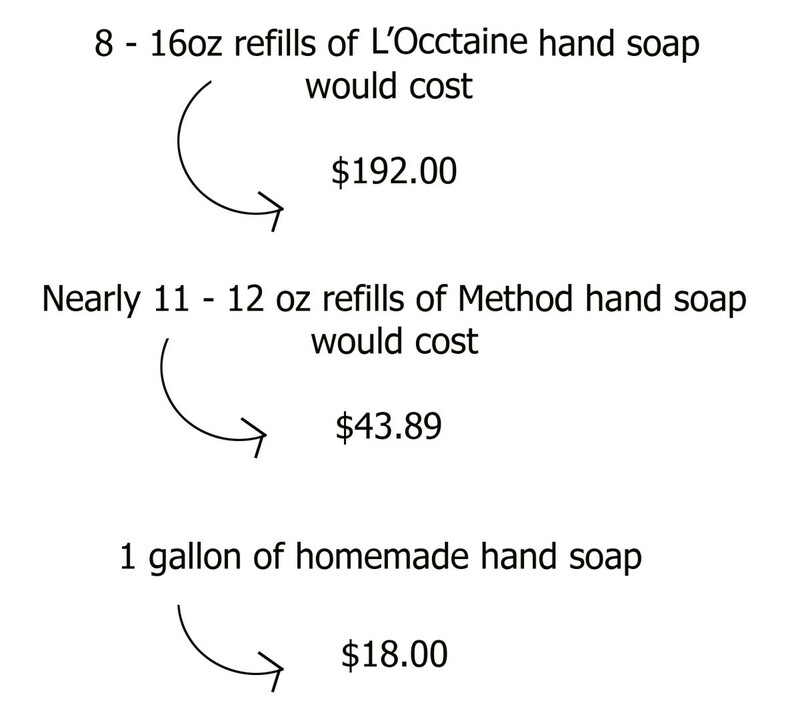 That is still a huge savings considering the amount of hand soap that I was able to make. However, you could possibly save even more more money! 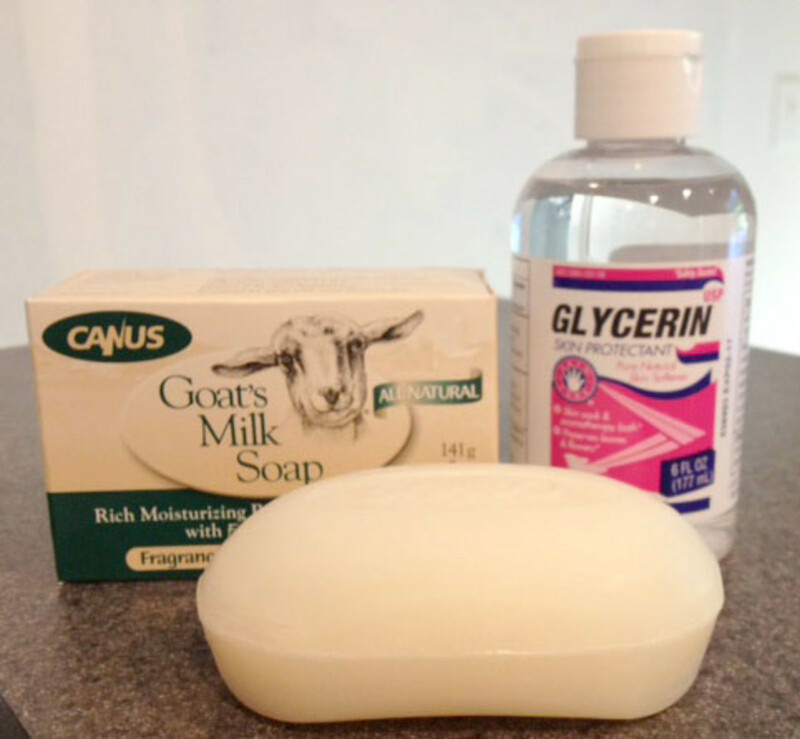 I chose to buy a goat's milk soap, as I have already mentioned. You could certainly choose a less expensive bar. 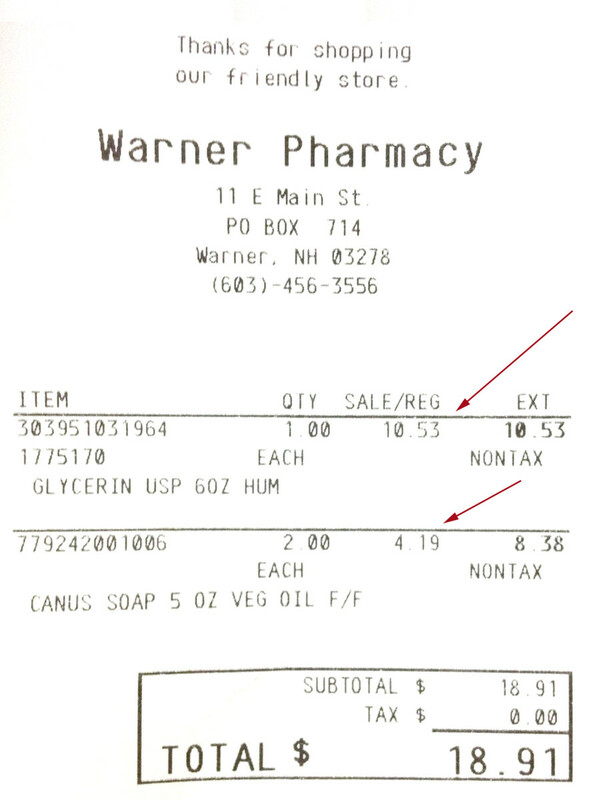 Also, after shopping around, I was able to local the same liquid glycerin at Walmart for $3.00. I planned on re-using the two soap containers that I already had. If you do not have any containers that you can use, there are so many other options available to you. Many stores sell pumps that you could purchase. The white one pictured to the right is from my kitchen. I put dish soap in it (yes, I make that too). I would also suggest that you take a look online for sites that sell pumps, whether they are glass, plastic or ceramic, there are plenty to select from. With my wooden spoon, I punctured through the top of the soap to a much softer center. While I was mixing with my wooden spoon I thought it would be more efficient to just plunge my hands in and break the soap up. That worked perfectly well, but I still needed to really mix it up. 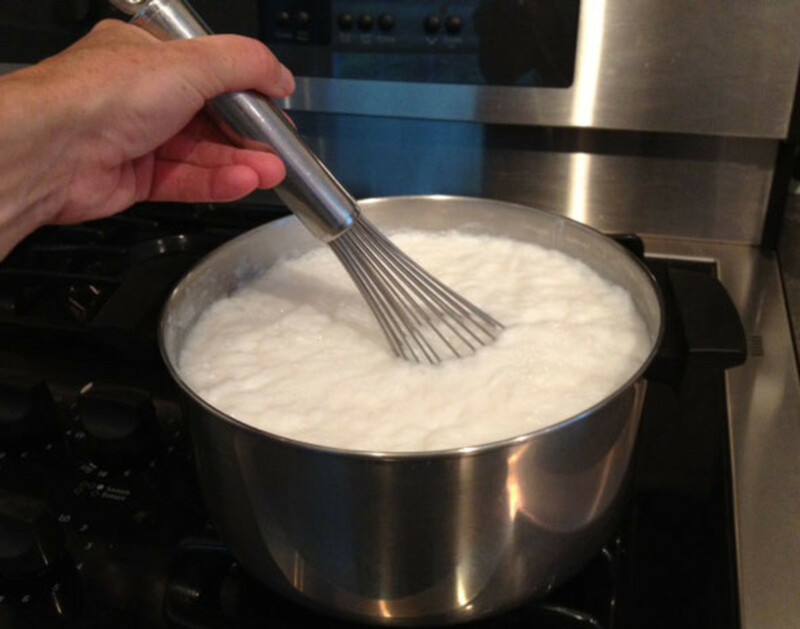 Once I had taken my wooden spoon and mixed the soap a bit, I thought that a wire whisk would then make blending easy. I was wrong. The soap was still much too thick for the wire whisk to do a proper job. 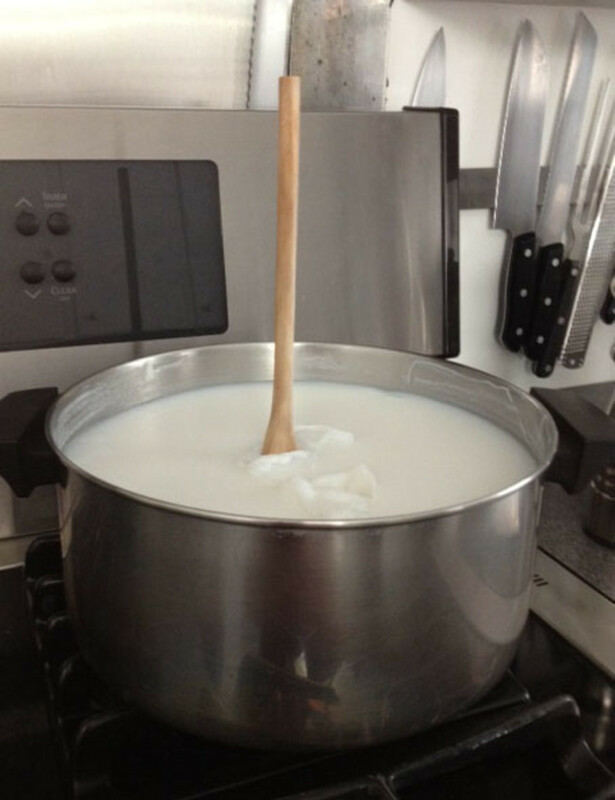 Of course, if I had made my soap in a larger pot, I would have had more room to whisk and perhaps it would have all worked out fine. Alas, I needed the hand mixer. Using the hand mixer was a much easier method. 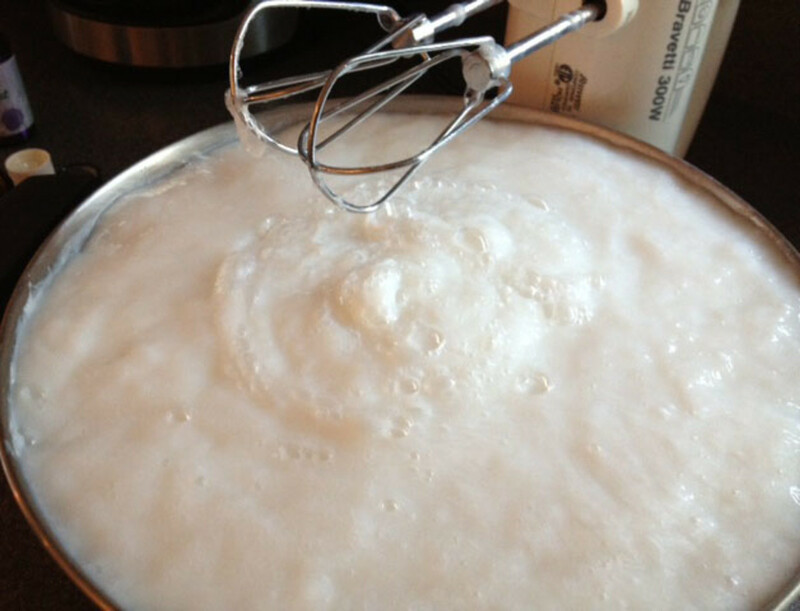 The more that you can whip the soap the frothier and more silky it becomes. Don't waste your time with a hand whisk. 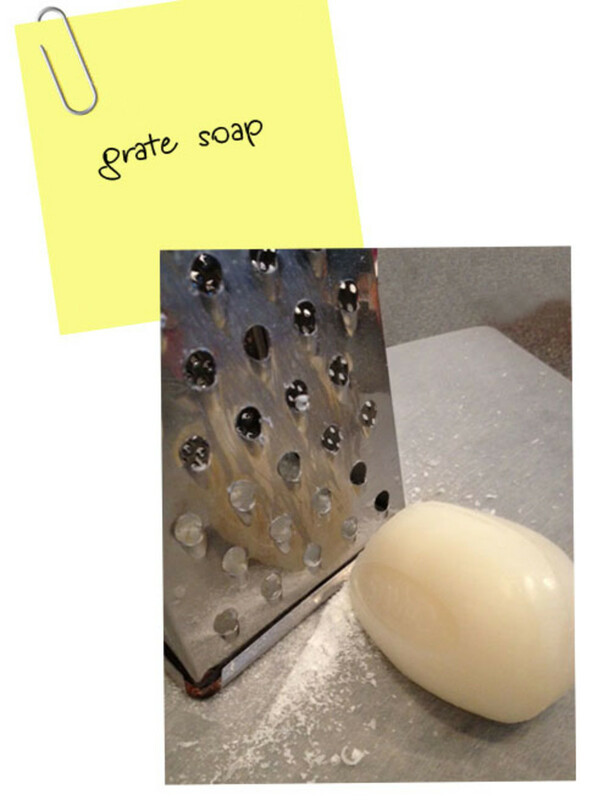 Because this recipe makes a gallon of hand soap, I opted to keep it scent-free. When it came time to fill my containers, I added a few drops of lavender to one container and a few drops of geranium to the other. If I choose to fill a third container as a gift, I can then scent it or leave it fragrance free. Check your local coop for a variety of essential oils. Cosmetic grade oils last for quite awhile, properly stored. Don't leave your oils in direct sunlight or in extreme temperatures. Depending on which oil you use, the prices vary. 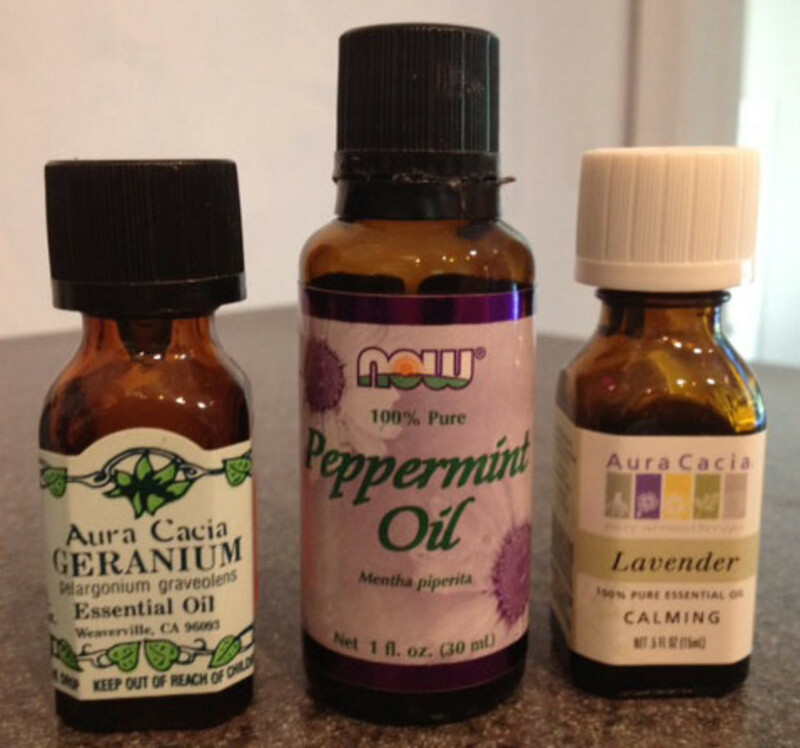 I enjoy peppermint oil for many things around my home. It happens to be rather inexpensive. Lavender is generally more costly. Geranium has a bright clean scent and I use it often in my bathrooms, however, it is one of the more pricey oils. One of the main reasons for making my own hand soap, like so many of the other cleaning products that I make is in an effort to rid a few of the chemicals from my home. One of the the popular chemicals found in so many products is sodium lauryl sulfate. There are a few different derivatives on the market being used and I would recommend that you do a little homework on them if it's important to you. There are two reasons that this chemical is used so often. 2. the manufacturer is given great incentive to add this chemical to it's products because we are creatures of habit. "foaming is a huge reward", said Sinclair, brand manager (for Pepsident). "Shampoo doesn't have to foam, but we add foaming chemicals because people expect it...Same thing with laundry detergent. Add toothpaste - now every company adds sodium laureth sulfate to make toothpaste foam more. There's no cleaning benefit, but people feel better when there's a bunch of suds. 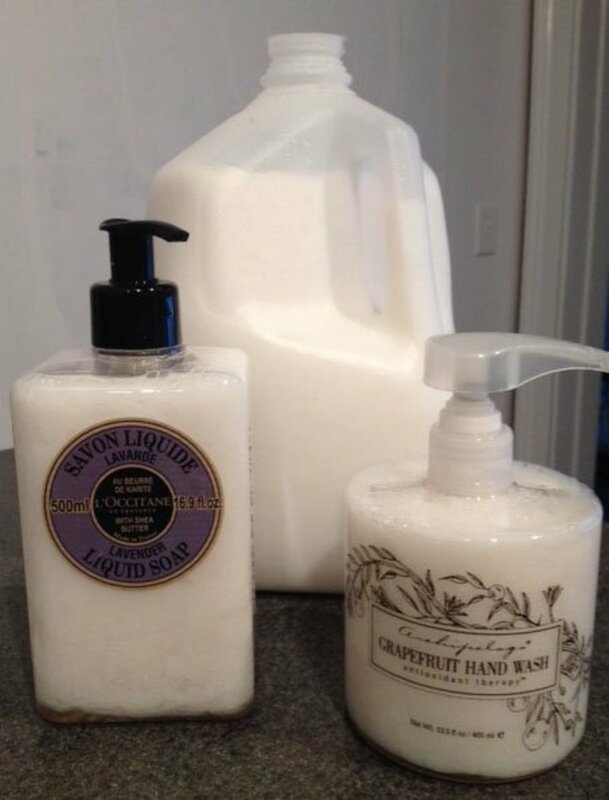 Once the customer starts expecting that foam, the habit starts growing"
I've tried and tired making liquid soap like this but it keeps separating after a day or 2. Is this what they all do? How can I stop that happening? Hi, It has been a few years since you posted this. 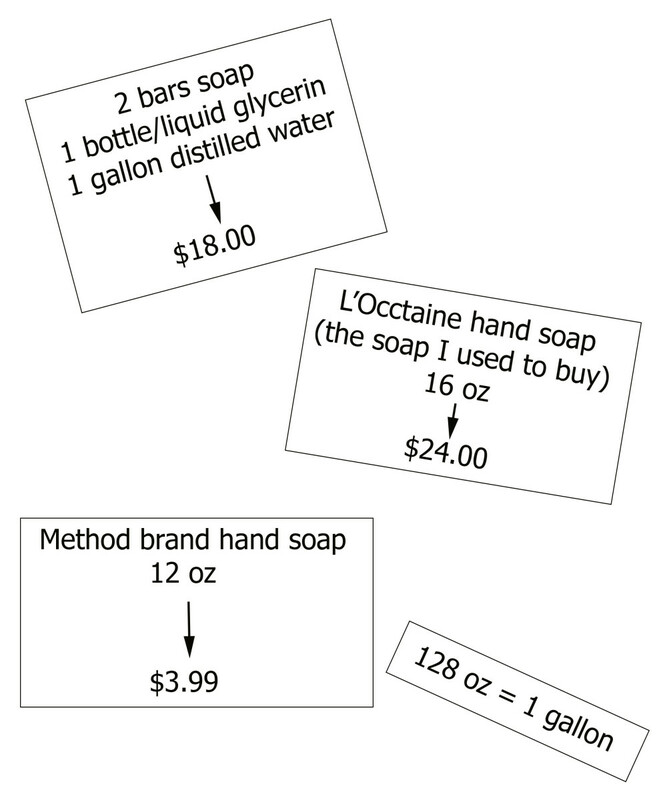 Are you still making your hand soap this way? I am wondering: does the soap separate after awhile? 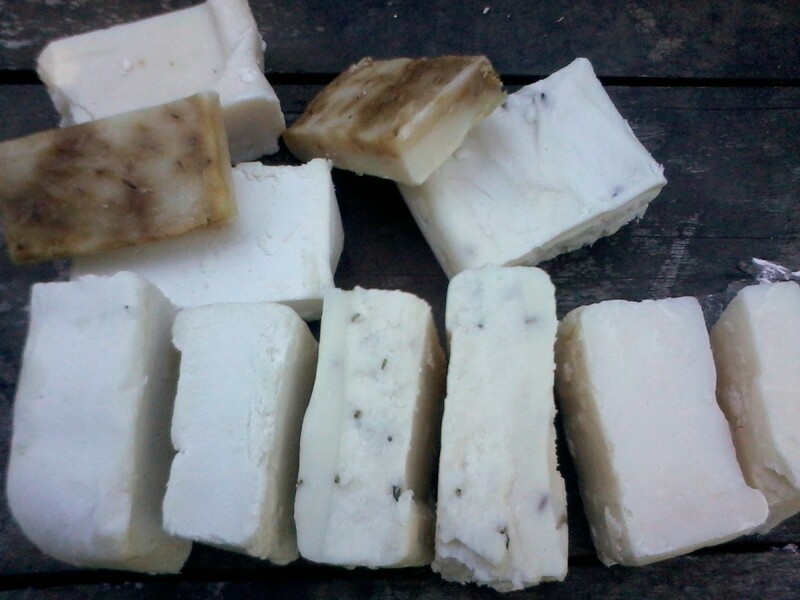 I have started making soap with my own goats' milk. It works out well, I think. I have lots of little bits and chunks left over, and not wanting to waste, am looking at trying a batch of liquid soap made your way. Thanks, hulah, for stopping by! 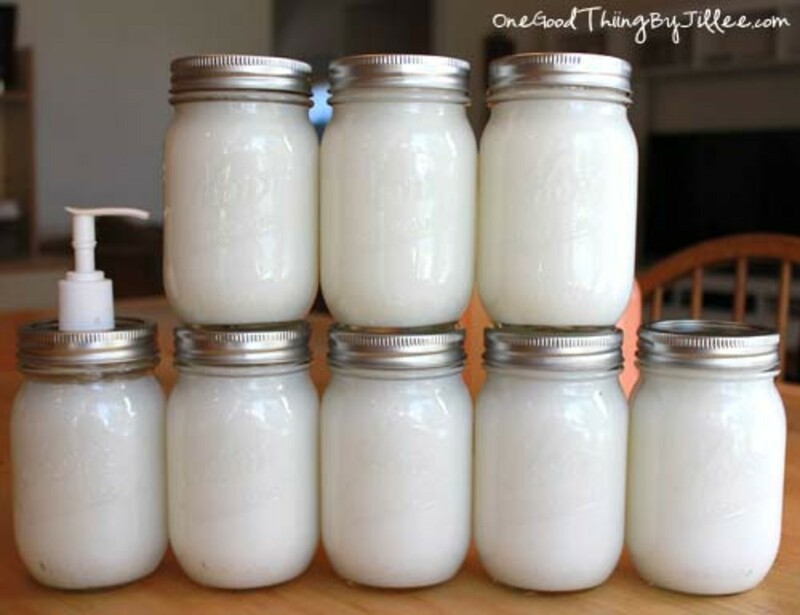 I love the natural ways of making an essential product at home. Will try it out. Thanks. This recipe make an enormous batch. I recommend that you cut the recipe in half to try it. It certainly saves a lot of money, however, and if you don't mind the consistency (which is not the same as store bought) you will be happy. An excellent article. I am always looking for a way to save money and come up with a more natural product. This is really wonderful. I love the idea of using goat's milk (though I might look for one without palm oil, responsible for the fastest deforestation ever witnessed and the demise of orangutans), and of adding honey and essential oils. The savings are mind boggling and your demonstration of them highly effective. I'm so glad I discovered this right before gift-giving season! Many thanks for sharing your secret. hi 4youreyes, I think that this project would be great to do with kids! Certainly, don't be timid - it is really that easy. Thank you for your compliments and for stopping by. 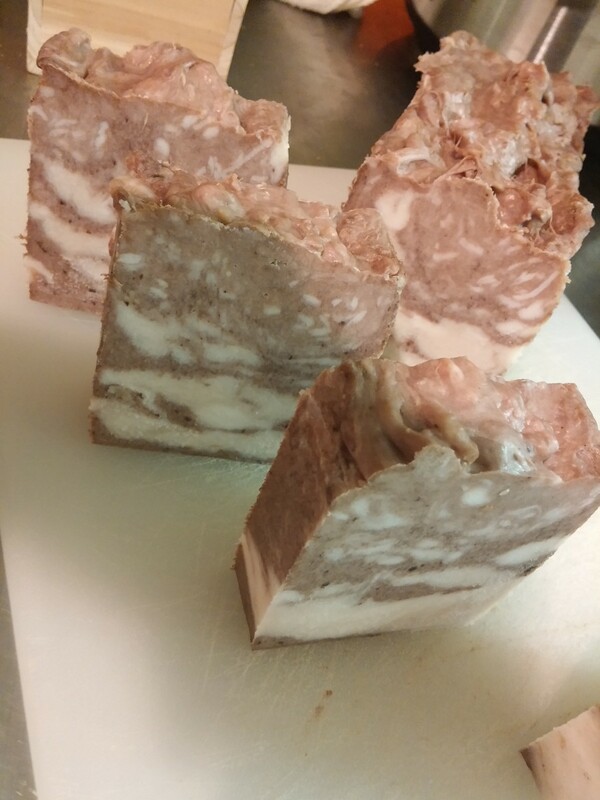 You have inspired me to make try soap making. It is something I've always wanted to to try but it always seemed so complicated. You've done a great job making it look easy with good step by step directions and pictures. Thanks this will be fun and share with my granddaughter.